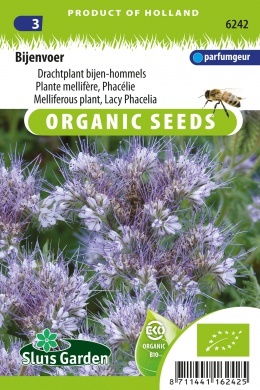 Phacelia tanacetifolia (lacy phacelia), is a.k.a. Bee bread, Bee feed or Bee friend. 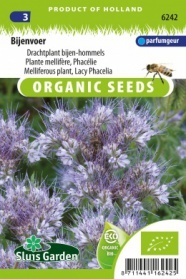 So it is an excellent plant for bees that with enough moisture produces a great deal of nectar. The deliciously fragrant flowers are beautiful to see and with a height of 70 cm, a splendid addition to your flower garden. Also naturally suitable as green manure (see no. 3294), so that in the autumn the plants can be dug into your soil. Provides a lot of organic matter. Your soil, but also the bees will be happy with it.